 KERN's international branch network (USA, Europe, Asia) allows you take advantage of the time difference. This means that we can also meet extremely tight deadlines using our local branch offices. When urgently required, KERN can produce translations in the most common language combinations overnight (24 hours) or over the weekend within a very short space of time. For time-sensitive translations, since the pathways must also be as short as possible, you should ideally transfer your documents to us using the online form or by email via kern.london@e-kern.com. Needless to say, you can also visit the KERN branch offices in person, send a courier or send your documents via post/express post. KERN's language centres can accept and reliably handle almost any volume and any project size. KERN's international translation hub is at your disposal.